COMBINATION OF METALLIC SILVER WITH FULL UNMARKED BLACK LEATHER UPHOLSTERY..... HUGE SPECIFICATION INCLUDING: SAT NAV, BLUETOOTH HANDS-FREE WITH VOICE CONTROL, ELECTRIC DRIVERS SEAT, HEATED SEATS, ELECTRIC SUNROOF, CLIMATE CONTROLLED AIR CONDITIONING, AUTO HEADLIGHTS & WIPERS, CRUISE CONTROL, KEYLESS ENTRY & START..... ONLY 2 PRIVATE OWNERS FROM NEW WITH 15 SERVICE STAMPS..... SUPPLIED WITH NEW MOT INCLUDING SERVICE & REPLACEMENT CAM CHAIN..... SUPPLIED WITH 12 MONTHS PARTS & LABOUR WARRANTY WITH NATIONWIDE COVER & 12 MONTHS AA BREAKDOWN COVER..... 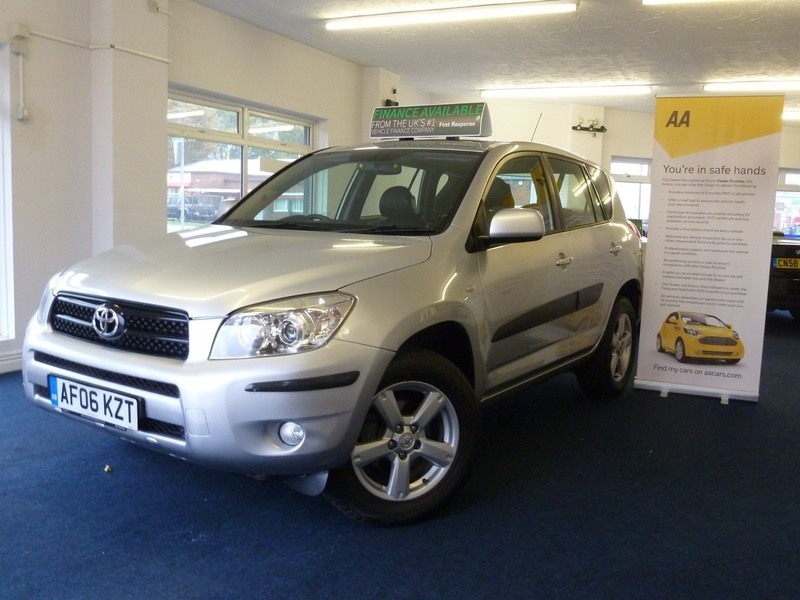 STUNNING 06 REG TOYOTA RAV4 2.0 XT4 AUTOMATIC 4X4. ONLY 126000 WARRANTED MILES (AVERAGE 10500 MILES PER YEAR). NEW MOT UNTIL 5TH SEPTEMBER 2019 (WITH NO ADVISORIES) INCLUDING SERVICE. 15 SERVICE STAMPS, SERVICED BY TOYOTA MAIN DEALER AT: PDI, 10620 MILES, 20605 MILES, 30276 MILES, 39856 MILES, 49975 MILES, 60052 MILES & 69004 MILES. SERVICED BY TEVERSHAM MOTORS AT: 77962 MILES, 84115 MILES, 96700 MILES, 100749 MILES, 107892 MILES & 119458 MILES. SERVICED BY OURSELVES AT: 126033 INCLUDING NEW CAM CHAIN FITTED. ALLOY WHEELS FITTED WITH EXCELLENT MATCHING UNIROYAL RAIN EXPERT TYRES WITH MINIMUM 6MM TREAD. ONLY 2 PRIVATE OWNERS FROM NEW WITH LAST OWNER SINCE 2012. SUPPLIED WITH 2 REMOTE FOBS, OWNERS BOOK PACK, TOYOTA FOLDER, TOYOTA CARPET MATS, TOYOTA PLASTIC BOOT LINER & COLOUR CODED SPARE WHEEL COVER. FITTED WITH TOYOTA REAR DVD SCREENS, DVD PLAYER & 2 SETS OF WIRELESS HEADPHONES (THE SYSTEM IS NOT CHECKED SO THERE IS NO GUARANTEE OF IT WORKING AS WE BELIEVE IT REQUIRES A REMOTE CONTROL WHICH IS NOT SUPPLIED). REAR ARMREST WITH DRINKS HOLDER, RETRACTABLE REAR LOAD COVER, LARGE STORAGE COMPARTMENT UNDER BOOT FLOOR, 12V POWER SUPPLY IN BOOT, FRONT FOG LIGHTS, PARKING SENSORS, FULLY COLOUR CODED. Please Note: For Further Information Please Contact Us On 01384 429630 Or 07825 137260. Finance Available With Upton 5 Years To Pay. The Vehicle Is Supplied With A 12 Months Parts & Labour Warranty With Nationwide Coverage & Unlimited Mileage, Extendable If Required. Free 12 Months AA Breakdown Cover. Any Trial Or Inspection Welcome. Viewing By Appointment. Please Call For More Details. Open 7 Days Til Late. Part Exchange Welcome, Please Contact To Agree Value. All Vehicles Are HPI Checked. All Major Credit & Debit Cards. We Are Located 5 Minutes From The Merry Hill Shopping Centre At Cradley Heath, West Midlands, B64 7AA. 10 Minutes From Junction 2,3 & 4 Of The M5. We Can Tax Your Car Ready For Collection If Required. Please Check Our Customer Reviews And Buy With Confidence, We Have Been Selling Cars For Over 20 Years & Customer Satisfaction Is Paramount. We Can Arrange Pick Up From Cradley Heath Train Station Which Is A 20 Minute Journey From Moor Street Station, Birmingham. Delivery Can Be Arranged, Please Enquire For Price.